Delhi’s eclectic range of street food is known and loved for many things. Hygiene is not among them. The capital where thousands of vendors sell snacks and meals from carts, stalls and the back of bicycles, lends its name to the stomach upset known to travelers as Delhi Belly and has a reputation for requiring diners to have a strong digestive system. Now, government officials and a group representing the street vendors themselves want to change that. Despite their doubtful hygiene, it is hard to resist the golgappas, aloo tikkis, ram laddoos, momos, etc., sold on the roadside. Though Food Safety and Standards Authority of India has formulated guidelines to regulate this unorganized sector, Delhi government has failed to effectively implement them. Now, the street vendors, themselves, are coming together to ensure acceptable standards of food quality and hygiene. Each vendor was handed a small kit containing an apron, a pair of disposable gloves, a plastic head covering, a small bar of soap and a long list of the do’s and don’ts of personal hygiene when serving food. 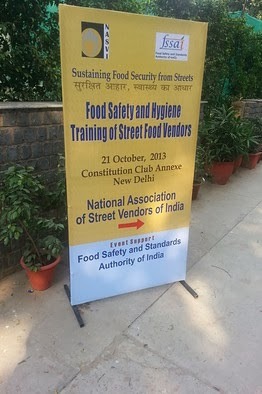 Recently, NASVI organized a large scale workshop on hygiene and food safety for street vendors. Street vendors from across the city were taught ways to maintain food quality and also informed about how this will help boost their income. "There is a need to create awareness about food safety among public and street vendors. If customers demand it, they will be forced to maintain hygiene. This will result in increase in their monthly income as they can charge more for providing good quality food," said K Chandramouli, chairperson, FSSAI, who inaugurated the workshop. In a first-of-its-kind initiative, National Association of Street Vendors of India has launched a catering service to be run and managed by street vendors. "If street vendors want to be taken serious, they will have to stand united. This initiative will give street vendors an opportunity to expand their base. Through this, we can keep a check on the quality of food served and hygiene standards maintained by street vendors," NASVI president Arbind Singh said. As per the plan, NASVI will send out street vendors, who adhere to the food safety and standards rules, to set up stalls at functions based on customer demand. "Our vendors arespread across the city. Depending on the place and requirement of customers, we will send our vendors," Ranjit Abhigyan, programme manager, NASVI, said. NASVI has also started an initiative to check food safety in markets. "We have appointed peer leaders in all important markets. These people will ensure that all the food vendors in the market adhere to norms. We have put up banners in markets on this," Ranjit said. For street food vendors, this is an excellent opportunity to work in an organized manner. While some feel that hygiene standards can't be maintained all the time, most are ready to experiment. Food especially junk food like pista, phel boori, sundal,masal vadai etc. is distributed in hand driven carts and placed very near schools, main roads especially near sewage canals. It is very unfortunate that even seemingly educated office goers with ties and coats prefer these kaiendhi kadaikal, and throw their paper plates, and waste food on the pavements. And the end of the day, everydaY, these paper plates and waste food are pushed inside the sewage canals, resulting in blockages. So much of mosquitoes, unbearable stinking smell, but yet the appetite of the office goer will not wait for a decent hotel nearby. The scenery in the rainy season is unbecoming of a developing country like us. The administration especially civic administration should come with a very heavy hand to control these unhygienic practices. God Bless them with good health.